Frequent Fox News contributor and founding editor of The Weekly Standard magazine, Bill Kristol is the son of Neoconservative godfather Irving Kristol. Politically active since the age of 12 (when he worked on his first campaign), Bill roomed with Alan Keyes at Harvard, and later ran his unsuccessful 1988 Senate campaign. 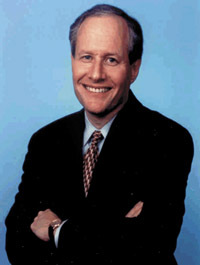 Kristol served as Chief of Staff for Secretary of Education William Bennett, and later for Vice President Dan Quayle (earning him the nickname "Quayle's Brain"). He is a close friend of Gary Bauer. As a pundit, Kristol called for the 1991 US war on Iraq, the 2001- war on Afghanistan, 2003- war on Iraq, and 2011 attacks on Libya, and he has repeatedly but unsuccessfully urged US attacks on Iran in the 2000s. After Kristol recommended that Pat Buchanan leave the Republican party, a pissed-off Buchanan responded on the Today show: "Let me tell you about Mr. Kristol. He runs that dinky little magazine that's subsidized by Rupert Murdoch that pretends to be conservative." "I think there's been a certain amount of, frankly, Terry, a kind of pop sociology in America, that, you know, somehow the Shia can't get along with the Sunni, or the Shia in Iraq just want to establish some kind of fundamentalist regime. There's almost no evidence of that at all. Iraq has always been very secular."